Your Choice of Gelato/Sorbet/Ice Cream, Milk of Choice, Whipped Cream, Sweet Cacao Nibs. Boosts (50¢) Chia Seeds, Coconut Manna, Maple Syrup, Enhanced Organic Greens, Florabiotic Essential, Clear Fiber. Boosts ($1.00) Plant Protein Powder, Whey Protein Powder, Hemp Protein Powder, Extra Fruit. Flavor Shots ($1.00) Amaretto, Caramel, Hazelnut, Raspberry, French Vanilla. Please ask about our selections of the day. 3 Scoops of Choice, Whipped Cream, Walnuts, Syrup of Choice (Caramel, Chocolate, or Strawberry), Sweet Cacao Nibs. Ginger Snap! Orange, Carrot, Ginger. Transfusion Pineapple, Beet, Apple, Ginger. Popeye’s Punch Spinach, Lime, Cilantro, Pineapple. Lightning Bug Lemon, Orange, Kiwi, Pineapple. *Please ask about our daily variety. Tender baby spinach, tomato, avocado, cucumber, sunflower seeds, and our house vinaigrette. Hearty kale, kiwi, apple, dried cranberries, fresh orange, walnuts, and our house vinaigrette. Salami, Turkey, Ham, Hardboiled egg, tomatoes, carrots, cucumbers on a bed of mixed greens. Seasonal fruit and feta cheese on a bed of greens topped with crunchy almonds. Creamy Tribe hummus and an assortment of fresh vegetables wrapped in a Rudi's gluten-free tortilla. Our made-in-house tuna salad, spinach, and tomato wrapped in a Rudi's gluten-free tortilla. Our made-in-house egg salad, spinach, and tomato wrapped in a Rudi's gluten-free tortilla. Egg salad and mixed greens on a Kaiser roll. Tuna salad and mixed greens on a Kaiser roll. Other Grab & Go options include Dolmas, hummus with dippable veggies, and assorted snacks. 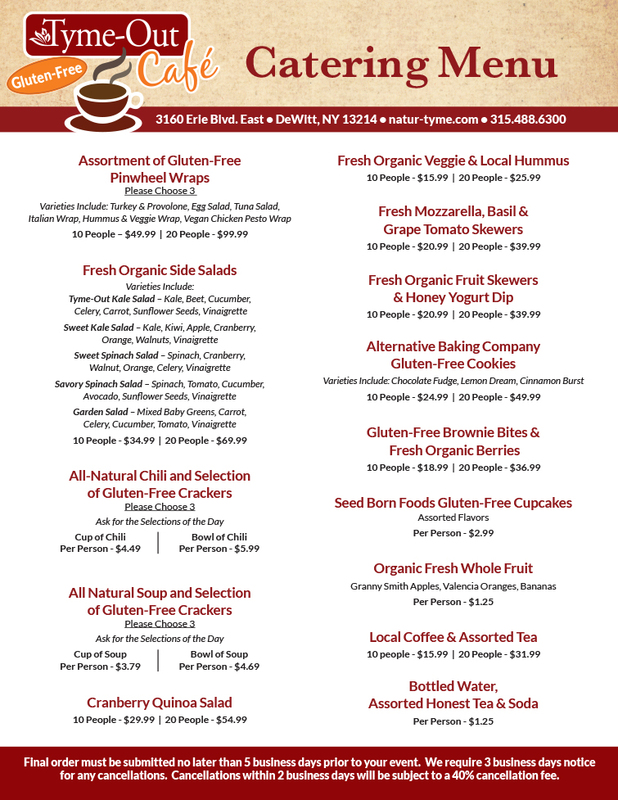 If you are craving something warm, stop by our Tyme-Out Café for a rotating selection of delicious gluten-free soups and chili. 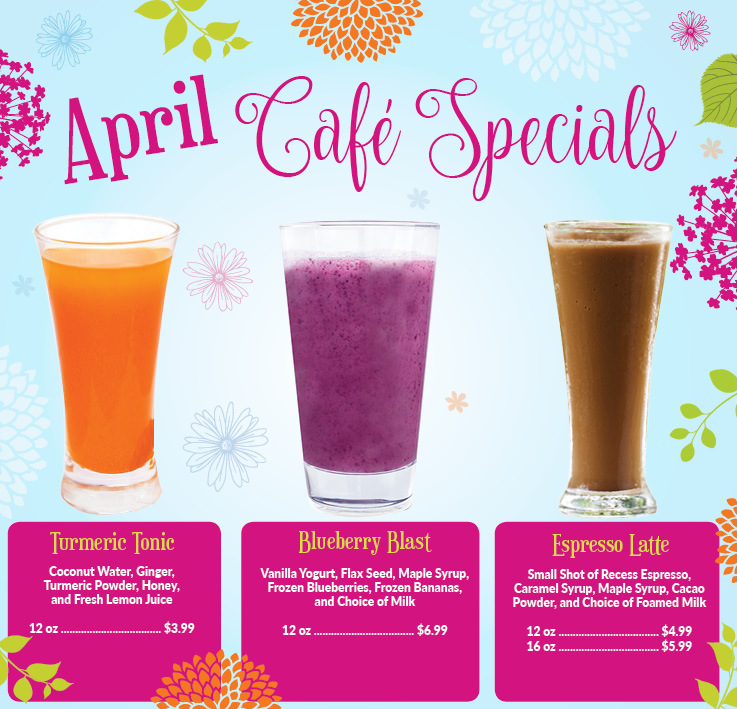 Custom Smoothie Pick a base, Choose up to 5 Fruits & Vegetables, then Select the Add-Ons of your choice. **Please allow 15 minutes for baking as this is a freshly prepared product.